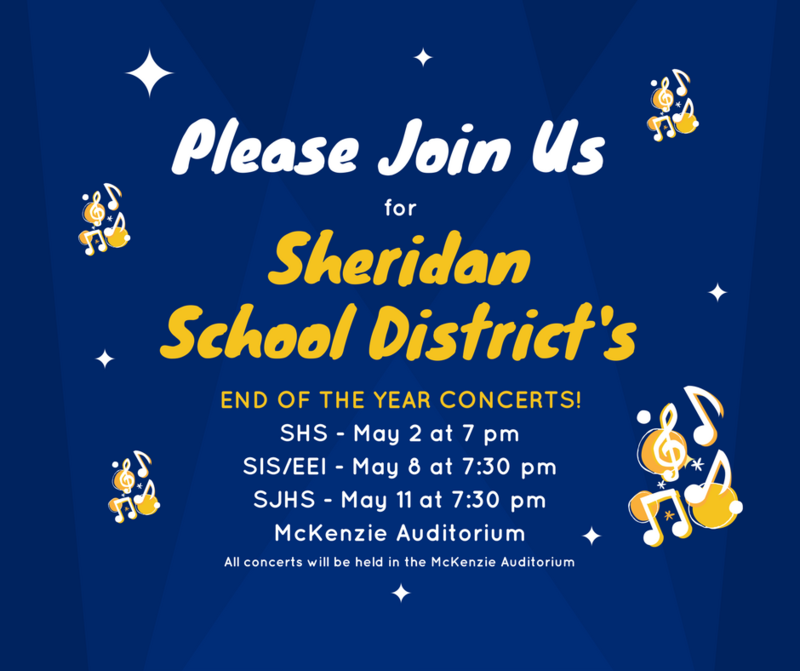 The Sheridan High School Bands will perform their end of the year concert on Tuesday, May 2 at 7 p.m. in the McKenzie Auditorium. The program includes new music from some of today's most successful composers, and we would love for you to attend. Both the Sheridan High School Concert and Symphonic Bands will be premiering selections from The Darklands Symphony. We collaborated with several schools across the U.S. to commission this work from 1994 Sheridan graduate, Randall Standridge, who is currently one of the most in-demand composers and clinicians in the world. The Symphonic Band also will be performing The Ascension (from The Divine Comedy) by Robert W. Smith, Lightning Field by John Mackey, and a joint performance with members of the Sheridan High School Choirs to perform Eric Whitacre's Sleep. The evening will conclude with the Sheridan High School Jazzin' Jackets. Their program includes Cherry Pink and Apple Blossom White by Perez Prado featuring Emily Kaucher on trumpet and A Cool Breeze by Sammy Nestico (written for the U.S. Army Field Band Jazz Ambassadors). They will conclude with Feeling Good by Michael Buble` featuring Noah Loyd on vocals. Admission is FREE and it is certain to be an outstanding night of music. Our Beginner and Junior High Bands will present concerts the following week. -SIS and EEI Combined Beginner Bands will perform on Monday, May 8 at 7:30 p.m.
-SJHS Junior High Bands will perform on Thursday, May 11 at 7:30 p.m. Thank you for your continued support of arts education in our school district. Go Jackets!